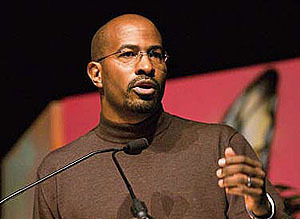 A few days ago, after a month of low-level sniping, Glenn Beck declared full-on war against Van Jones, an environmental activist who had been appointed an advisor on green jobs to the White House Council on Environmental Quality. Why? Well, Jones had been fairly radical in the early 90s, which was probably enough, but it’s more likely that the real reason had to do with a recent boycott of Beck’s show spearheaded by ColorOfChange.com, a group that Jones co-founded in 2005. Jones left the group a couple of years ago, but no matter: Beck wanted revenge and Jones was an easy target. So now Beck has his scalp and our effort to generate green jobs during a recession will be just a little less effective. Lovely. UPDATE: More here from Gawker (“The story of how the President’s Special Advisor for Green Jobs became the biggest, scariest villain of the right wing (this week, anyway) is also the story of how the right wing information delivery process works now”) and David Roberts (“For the record, Jones isn’t a truther”). The wingers, of course, are ecstatic over all this.